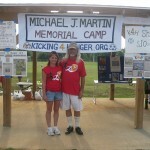 For the past five years Mike and Bonnie have worked at the www.kicking4hunger.org Soccer Camp, founded by one of Michael and Andy’s teammates. 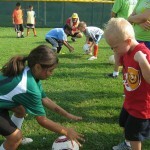 The instructional and motivational camps are for kids ages 6-14. Youth who may not be able to afford other camps are able to participate for a donation of 5 cans of food for each day. 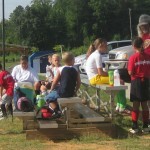 Bonnie is a coordinator, nurse and Mom, while Mike helps oversee the instructors as Coach Dad. 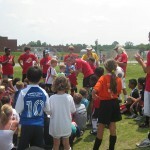 Numerous young adults volunteer their time as coaches through their association with Michael’s Moon. Mike and Bonnie are able to have one-on-one interaction with the kids, talk with them about their dreams, and try to instill ambition and vision to be whatever they want to be. A Michael J Martin award is given to the biggest “dreamer” and awards are also given to the biggest canned food donors. 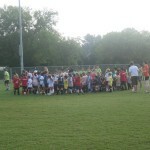 There are two or three 3-day camps at CC Griffin Middle School in Cabarrus County, NC. 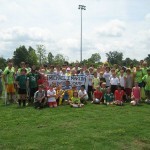 Another camp is held at Michael’s old Bethel Elementary School and is called the Michael J Martin Memorial Camp. Food and donations are given to the Concord Christian Food Pantry, and small collections are taken for Michael’s Moon.